When I found out I was pregnant it was one of the best days of my life (until the birth of my daughter of course) I always wanted to be a mom and knew that I would love it. I had an "easy" pregnancy, nothing out of the ordinary, although there are a lot of things they don't warn you about like the killer hip pain! I'm sure I am not the only one, but I had this weird constant worry that somehow the pregnancy wouldn't take and I would lose the baby. It was this fear that kept me from working out like I had been. When I stopped working out I got extra tried, the first trimester will do that to you and I started to crave carbs. I am not a big fan of white carbs, never really have been, until I was nauseous all day and the only thing I could get down was a bagel. Sure enough, as white carbs do, I was stuck in the cycle of wanting more. I guess looking back I can't really explain why I ate the things I did, don't get me wrong I still ate healthy, but my portions were out of whack and I was eating way to many white carbs. Long story short, I ended up gaining around 60 pounds. The thing is when you are pregnant people tell you its ok to gain weight and eat what you want, the reality of the matter being you really only need about an extra 300 calories per day for the baby that is growing. You are not eating for two, although my pregnant brain said I was, you are eating for one and a tiny little baby. The day I gave birth I weighed a staggering, for me, 228! I look back at pictures, and I don't feel that I looked that big then, now I realize how big I was. When I got home from the hospital I was down to 200, and I knew that I had to undertake the task of getting back to my pre-baby weight. However, I was a new mom and that is what I focused on, not the weight or how my body looked. I was nursing which definitely helped shed some of the initial weight (mother nature is smart like that), but once I was cleared for exercise by my doctor I started walking on the treadmill for 30 minutes at a slow pace and doing some light weights. I am fortunate enough to have a home gym, so I would put my little one in her bouncy seat, the sound of the treadmill lulled her to sleep, and I would get my workout in. I was gentle with myself and was ok with the fact that I wasn't working out like I used to. I knew in time I would get there. With some advice from a blogger at Can You Stay for dinner?, I just kept moving! When the weather got nice I started to walk 3 miles everyday, and as the days got warmer, I found myself getting stronger. I added weights back into my routine. It took time and commitment, and most of all consistency to get back to my pre-pregnancy weight. Once I got there I was determined to lose another 10-15 pounds, and I challenged myself to do the Jillian Michaels Ripped in 30 DVD for 30 days in a row (I took a rest day on Sundays). It was hard, but so worth it. I added a few of her other DVDs to the mix to beat the boredom. I am happy to say that I am actually 14 pounds lighter now that when I got pregnant and I have built my muscle back up to where it was. I am still a work in progress, as I constantly set new goals for myself and am working on losing another 10 pounds and building more muscle. I am back to designing and doing my own workouts, making sure I challenge myself. I want Jillian Michaels arms and abs, and I know that with the determination that I have I will get there. I want you to know that whether you are a new mom or have older children that it is never to late to get the body that you want. Focus on eating real whole foods, ditching the sugar and processed junk and exercising consistently. It is important to me to set that example as a personal trainer and a mom. I want to live life healthy and happy, and I want the same for you! 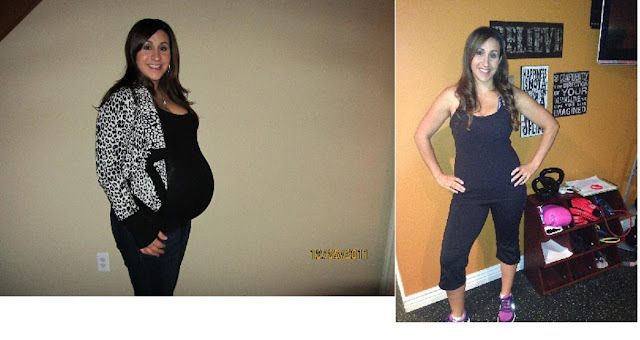 The first picture is me about a month before I gave birth, it actually still hurts to see how much I gained.. The second was taken when my daughter was 19 months old. I'm actually about 15 pounds lighter than I was when I got pregnant.